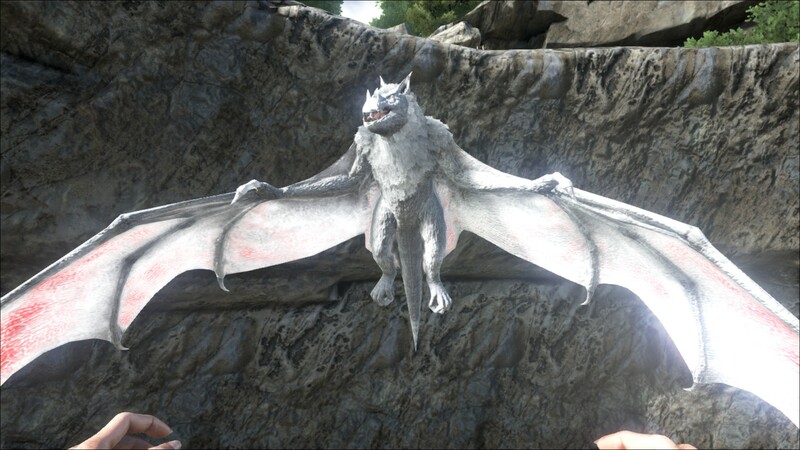 The Onychonycteris (OH-nick-oh-NICK-teh-riss), or simply Bat, is a species of Mammal in ARK: Survival Evolved. They avoid Titanoboa whenever possible, which leads me to believe the snake to be a natural predator of Onychonycteris. While flying in the dark caves would be difficult for any creature, Onychonycteris' ability to use echolocation has allowed it to adapt perfectly. 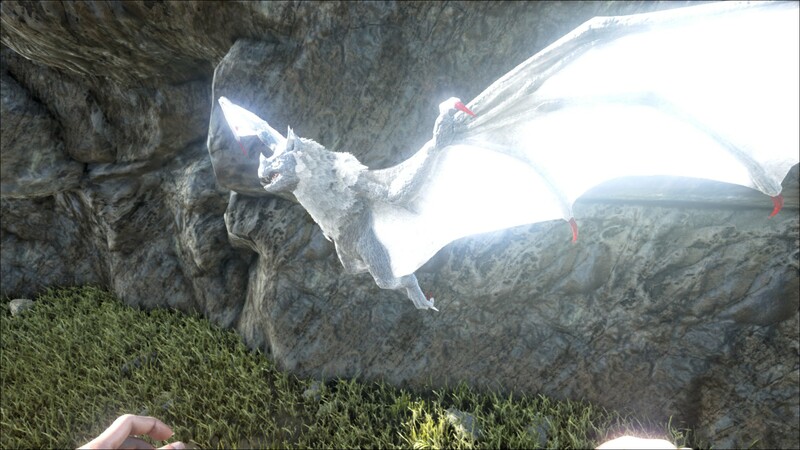 It can be found idly flying around the caves as often as it can be found hanging from bits of the cave ceilings. Not large enough to be used as mounts, and not strong enough to carry much, Onychonycteris still function well as a guard animal. Whether protecting a vacant home or members of a tribe, their relatively vicious nature has its uses. Bats usually fly around in caves and become aggressive when players get too close. Their pathing is currently very poor, but be careful around corners - they may attack you from the side! 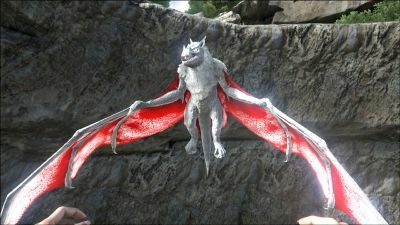 Due to their protocooperation with the insects inhabiting caves they can turn aggressive towards players even if they have attacked a nearby Araneomorphus or Pulmonoscorpius. When close they will slowly fly to you to attack, when hit they will fly faster and will be harder to hit. Their bite has a 10% chance of inflicting Mega Rabies. Bats, unlike birds, keep themselves aloft by use of long fingers which are connected with a wing membrane. Bats are good and enduring flyers, but they cannot move around in any other way. Unable to sit, bats must cling to a cave niche and remain hanging upside down to relax or to sleep. Bats are lightweight, with short and mostly brown to gray fur. They have arrowheadlike incisors, which help to part small prey animals. This section displays the Onyc's natural colors and regions. For demonstration, the regions below are colored red over an albino Onyc. The colored squares shown underneath each region's description are the colors that the Onyc will randomly spawn with to provide an overall range of its natural color scheme. Hover your cursor over a color to display its name and ID. For example, "cheat SetTargetDinoColor 0 6" would color the Onyc's "body" magenta. The Onyc is tamed non-violently, rather than through the use of tranquilizers, and requires a player level of 65 to feed. Since it is a naturally aggressive creature, you must first apply Bug Repellant to yourself in order to keep it from attacking you on sight. The Bat will not be tameable if it is trying to attack another creature or is feeding on a corpse, so you must remove any such distractions from the area, or lure the Bat to a more secluded area. Once you have the repellent applied and distractions dealt with, place the food you wish to feed it in the right-most slot of your hotbar. Then, carefully approach the Bat until the button prompt to feed it appears - it will eat the piece of food you give it and a taming bar will appear. You must then wait until it becomes hungry enough to be fed again, and repeat the process. If you accidentally get too close and touch the Bat, it will become aggressive and attack, despite the repellant. In order to continue taming it, you must get far enough away for it to lose interest in you. A Ghillie Suit can be used as a substitute for repellant, but you will need to be prone to get close enough to tame it, leaving you vulnerable to attacks. This section describes how to fight against the Onyc. Onyc's appear in caves in huge numbers and can shred even flak armor with ease. Wearing hide armor is quite recommended so you can repair your armor on the fly while still providing protection. In the close-quarters of the cave you will likely only get 1-2 shots off before the Onyc is on top of you so you will rely heavily on melee to kill them. Concentrate fire with allies and evade melee as much as possible. It should be noted that their damage rapidly compounds massive armor damage and the faster you can kill them the better. Close-range weapons are necessary. A shotgun is expensive but guarantees victory against all but the largest swarms. A pike can prove capable of piercing many Onycs at once, and a shotgun will obliterate them once they are close. If you are caught by large numbers of bats without armor they will make short work of you. They also synergize extraordinarily well with other cave creatures that specialize in locking you down with tranquilizing venom and web attacks. Becoming immobilized by other creatures in the cave will render you susceptible to the Onyc's armor-rending attacks. 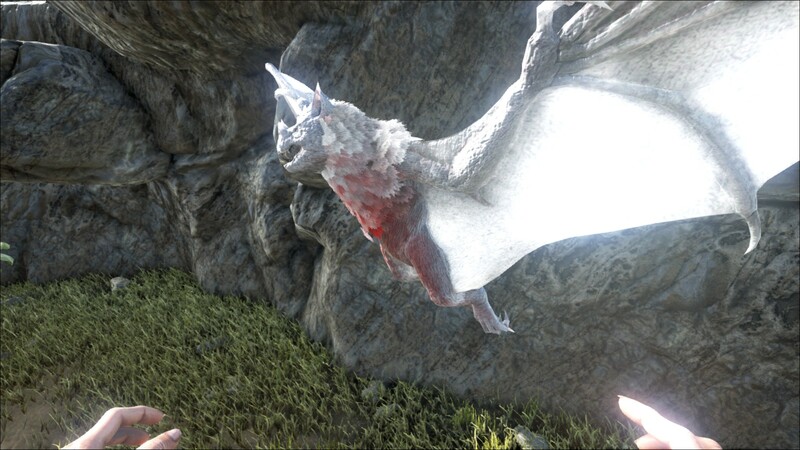 Keep your armor repaired, and bring materials to repair it on-site if possible (remember you can skin Onycs, Sarcos, and Titanoboas for necessary hide but typically cannot gather fiber where bats are found). In Patch v261.0 Onycs gained a 10% chance to inflict Mega Rabies on hit. This makes getting hit much more dangerous to unprepared survivors. Consider bringing Lesser Antidote when exploring areas that Onyc are in. Don't be afraid to retreat and hit-and-run large clumps to death as the Onyc is surprisingly bad at chasing. Bringing mounts is extremely effective as even a lowly Dimorphodon can prove a necessary distraction to deal lethal damage or, in numbers, fight the bats easily on their own. Usurper: The ability to ruin a player's armor easily is a skill that, employed correctly, can allow a low level player who has obtained one to tactically use this power to eliminate a higher-level player. A nighttime ambush on an oblivious survivor can result in the higher-level player losing their armor while the player works to kill them. This method can be made simpler by utilizing an Arthropleura, which also quickly destroys an enemy's armor. 3-5 Onychonycteris can easily shred through even the best armor, so it is advised not to wear valuable armor when exploring caves, as they are usually everywhere and in high quantities. The generic name Onychonycteris means "clawed bat" in Greek. The specifc name specuncola appears to be an improper combination of Latin specus "cave" and -cola "dweller" (thus "cave dweller"), possibly via confusing/conflating specus with spelunca (from Greek σπῆλυγξ spêlunx), which also means "cave"; the correct form would be either specicola or speluncicola. The bat in game is much larger than a real Onychonycteris, which actually wasn't very big. Real life Onychonycteris were incapable of the echolocation of modern bats. When cheat-summoned, it will have the Seeker icon instead of the Onyc icon. 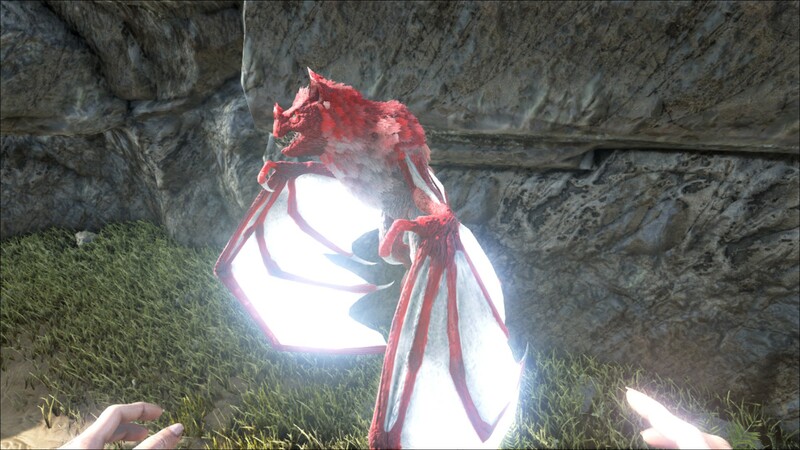 As the Onyc cannot land or swim, they cannot be cloned using the Tek Cloning Chamber, cannot be teleported using the Tek Teleporter, and cannot leave the northeast cave if tamed there.